Make amazing shrimp and grits in minutes with Addiction Sauces' Jalapeno Cheese Grits for sale. With a dash of crisp Jalapeno peppers, a swirl of butter, cheese, and authentic Louisiana spices, Addiction Sauces' signature grits recipe is addictive and effortless. Just add water to the package and you have a side or meal starter ready to go in minutes. 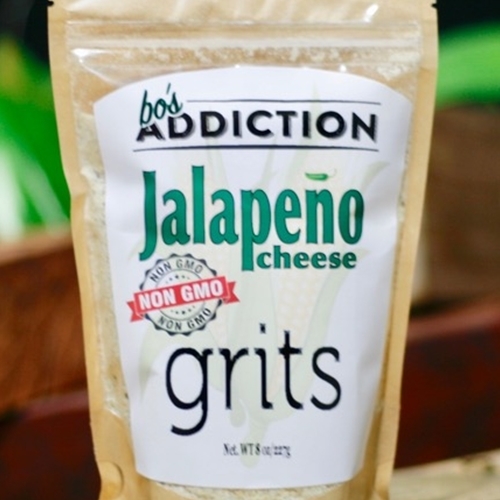 Addiction Sauces' own Jalapeno Cheese Grits won first prize at the 2015 Scoville Award for Unique Products, and continues to satisfy at kitchens and dining tables across the nation. Bring the delicious recipe to your table and order a package or case online.